In order to begin processing payments, you’ll need to enable Due Payments on your Due.com account. If you don’t have an account yet, you can sign up for free here. 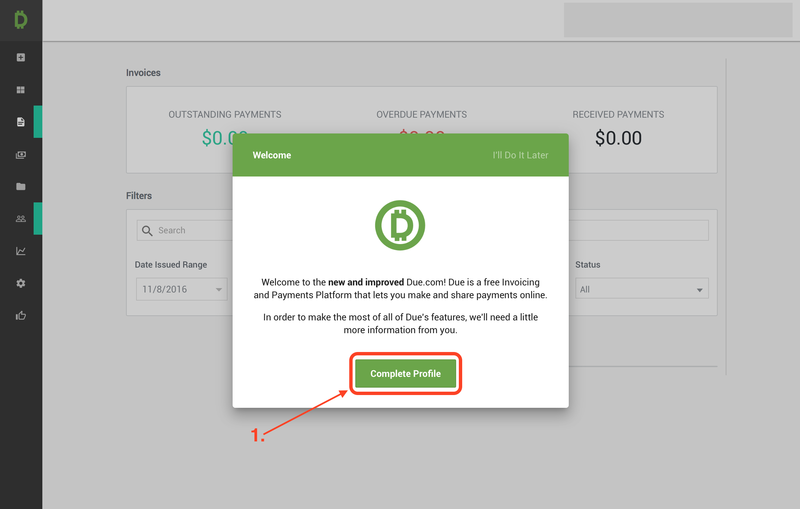 Here’s how to enable Due Payments on your Due.com account so you can start processing! Make sure you sign up for the right account type. If you’re operating under a legal business entity, choose the business account. Each account type will have different requirements. 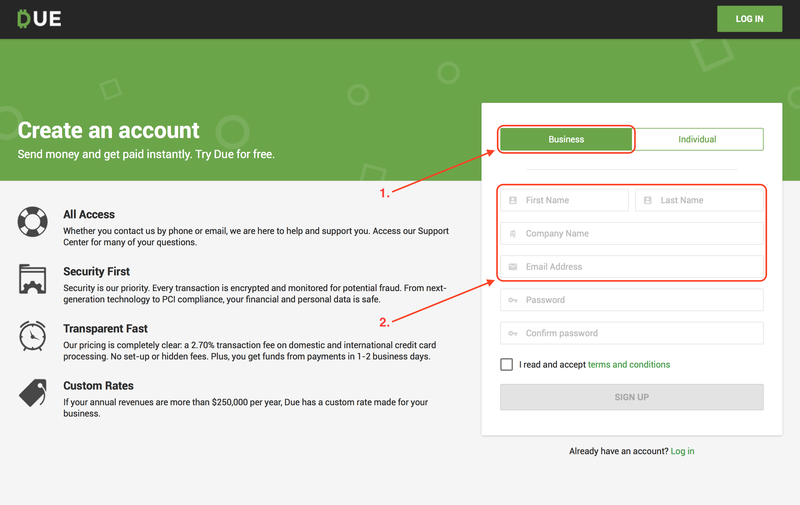 Most user’s processing payments with Due choose the ‘Business Account’ option. When filling out the rest of your account information, make sure it’s consistent with your Business information. Make sure the company email is consistent with your company name (if applicable). Once your account is created, go ahead and complete the rest of your profile by filling out your Settings. You can save this for later, but we strongly recommend doing this right away. In order to process payments with Due, you’ll need to complete your ‘Settings’. This allows us to verify our users and mitigate any risk of fraud. It’s a fairly long process but it is required for all merchant accounts. Make sure you start in the ‘General’ section in the ‘Settings’ tab. All fields that are highlighted in red are required. Make sure you’re as descriptive as possible in this section. This makes the underwriting process much easier. For these values please give your best estimate. If your values are inconsistent with the rest of your business information, this may delay the onboarding process and flag our risk department. The ‘Contact Info’ section is for your personal contact information. In order to verify your merchant account, your SSN is required. All data is encrypted and kept extremely secure. Your phone number, contact email, and personal address doesn’t need to match your business information. In this section, you can connect multiple email addresses to your account as well as choose your primary email. If you want to delegate Due Payments to your finance department, for example, you can add their email address here and make it the primary contact. A Merchant Category Code (MCC) is a 4 digit code assigned to businesses by credit card companies. 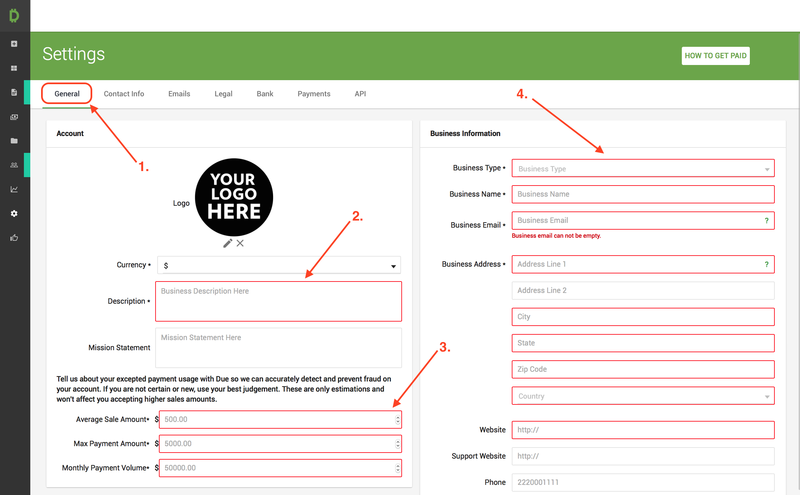 If you’re unsure what your code is, you can access a drop-down menu and insert the description that best fits your business. At the moment, you can only add one bank account to your Due.com account. Once you’ve connected your bank account your successful transactions will be automatically transferred to your bank account. Most transfers will deposit within 1-2 days after the batch is settled. Once your information is complete, click ‘Add Bank’ to connect your bank account. For Due Payments, there is no need verify your bank using micro-deposits. If filled in correctly, your bank should be added instantly. 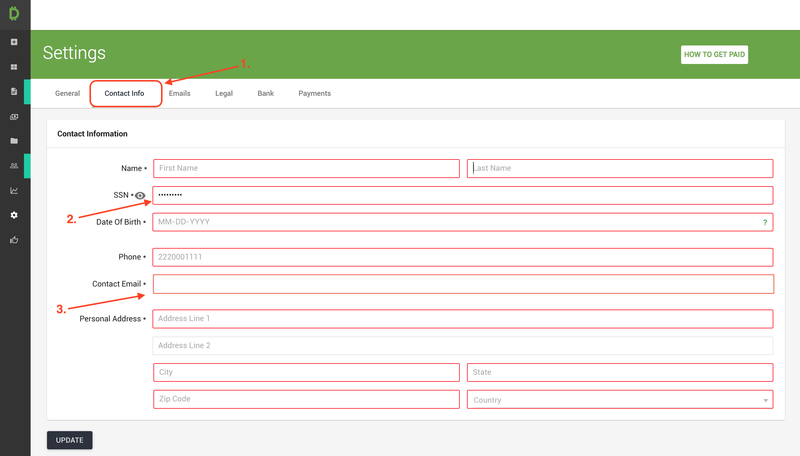 In order to enable Due Payments, you’ll need to go to the ‘Payments’ section. Your Payments Settings will tell you the status of your Payments. In this case, your Due Payments are not yet enabled. 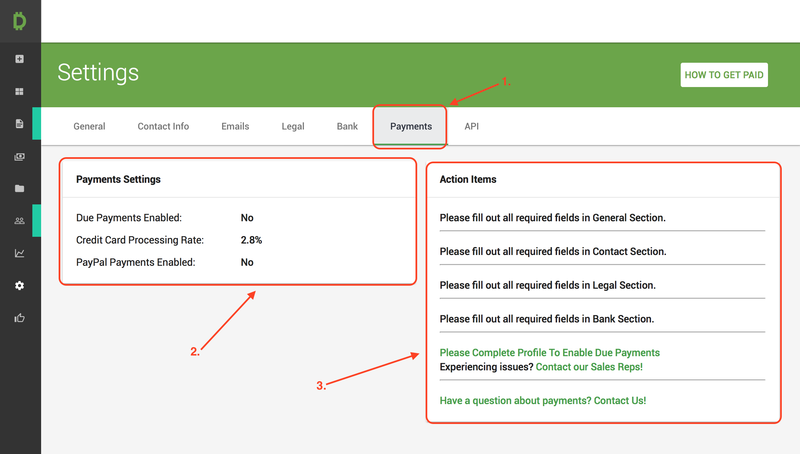 The Action Items show what information is required in order to Enable Payments. Once all of your Settings info is filled out, the ‘Payments’ section should look like this. Click on ‘Enable Due Payments’ when you are ready to begin the underwriting process. Once you click Enable Payments you will have submitted your Due Payments application. Your application will then be reviewed by our risk and compliance team. Please note that you will not be able to process payments prior to our review. If our risk and compliance team requires more information about your account, you will receive an email from a member of our support team requesting this information. Please note that our risk team does not communicate directly with merchants. This is for security purposes. Typically this process takes 2 – 3 business days to be complete. However, it may take longer depending on the volume of payment applications. For any questions or concerns feel free to reach out to support@due.com anytime! Next PostIs It Even Worth Investing in Media Such as Newspaper and Radio?